Until his sister's wedding two summers ago, Mario Ridolfi had never written a speech. Yet the three-minute speech he made at the wedding was a smash. "People were speechless. Half the hall was crying," Ridolfi recalled. Only Ridolfi didn't write it. Instead, like more and more members of wedding parties, including brides and grooms, Ridolfi relied on the services of a professional speech writer to make him sound good. "I gave him the ideas and he put them into the right words. I could've done it,but it wouldn't have had the right effect," said Ridolfi, 35, a systems analyst who is better with numbers than he is with words. Carrie Teeple picked Milevoy to write her wedding speech because she liked the sample work on his Web site. Teeple, 28, a London, Ont., secretary studying to become a French teacher, wanted to make sure the speech she delivered at her wedding last summer to Darren Isaac was perfect. "I was thinking about that speech for over a year. I needed help planning it. I'm not very good at speaking in crowds. But it went really well -despite my nerves. I got quite a few comments from people saying it was really funny," she said in a telephone interview. Milevoy likes to incorporate humour in his wedding speeches. "I try to start with something lighthearted or with something interesting. It makes people more open and engaged. I usually end off with the sentimental stuff," he said. Once upon a time, bridal couples depended on wedding portraits to evoke precious lasting memories of the occasion. Then along came video, digital photography, CDS, DVDs, and websites that are now used to document the occasion for life. As a result, married couples realize the significance of delivering memorable speeches because each word will inevitably be caught on tape. "Custom, personalized speech writing services are one of the latest entries in the wedding industry," says Alan Milevoy, founder of Words2Touch Speech Writing Services. "Wedding speeches can be a wonderful experience and offer insight into the lives of celebrants, or they can be the most boring and embarrassing part of the reception. Unfortunately, too many wedding speeches lack the appropriate amount of humorous, heartfelt and memorable sentiments," he says. We've all been there... At the reception of a wedding listening to poorly written speeches when suddenly someone stands up and has everyone laughing one minute, crying the next. A good speech makes a world of difference. If the idea of giving a speech at a wedding fills you with dread consider this: a speech writing service that offers a humorous, personalized speech sure to win over the crowd. Words2Touch Speech Writing Services is an affordable, custom speech writing service that provides any kind of speech, including best man, maid of honour, groom or father of the bride speeches. The work is gratifying, Milevoy says, as customers are so relieved to find someone who can write the speech for them. "Standing up in front of a large crowd and giving an eloquent speech, or toast, at a wedding makes most people very nervous," he says. "However, with a small dose of courage - and some great writing - a wedding speech, or poem, can be one of the highlights of one of the most memorable days of your life." 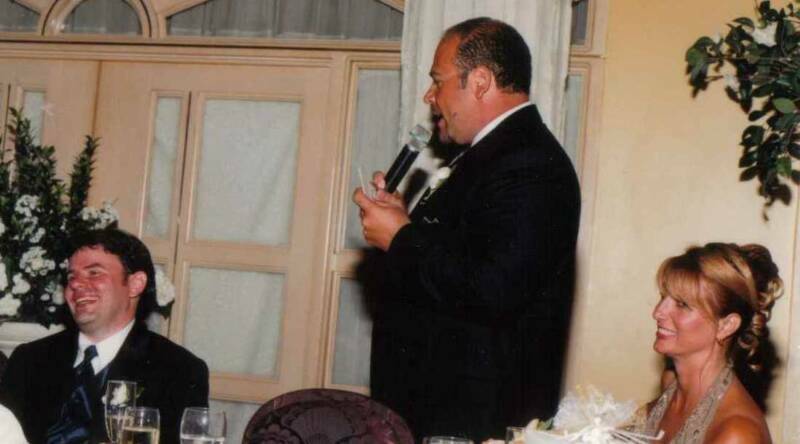 Making A Speech Or Toast At A Wedding? Statistics tell us many people fear public speaking more than death - and yet, you have to stand up and make a speech or toast at a wedding. If you're not sure what to say or how to say it, Words2Touch can help. The company, founded by Alan Milevoy, crafts not only speeches but also humorous poems, suitable for brides, grooms, and anyone in the wedding party who is called upon to make a speech. Alan knows the value of a perfect speech. 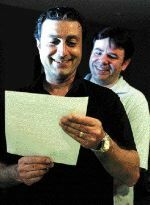 In 1999, as best man at a friend's wedding, he delivered a speech that was very well received - and led to a change in opinion about Alan in one of the guests. She had met him three years previously and found him "aloof," but his best man's speech helped her to realize he had a sense of humour and a heart. Two years later, she and Alan were married, and they now have a son. While Alan can't possibly guarantee such spectacular results for all Words2Touch speeches, the testimonials on his website prove the popularity of his creations. In the June 25th edition of The Montreal Gazette, writer Monique Polak profiles Words2Touch and paints a really nice picture of our service through some research on the speech writing market, and interviews with its founder and customers. The article was such a hit that it was also published in the The Ottawa Citizen and The Edmonton Journal.